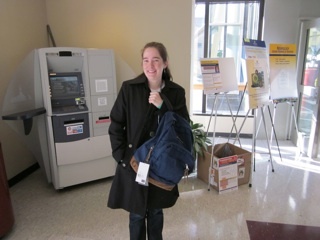 Welch Photo Contest winner Emilee Flynn looking smart with her brand new backpack (and also nalgene bottle and a few other goodies). Emilee was a gem to meet me outside the Daily Grind in the BRB on a sunny afternoon. Excited to win the contest, she was all all-glow to receive her new stuff. I was going to keep the backpack for myself, but that wouldn't be nice.